Diets high in fat increase risk of weight gain. Protein and carbohydrate each contain 4 kcal of energy per gram, whereas fat has 9 kcal per gram. Moreover, dietary fat is efficiently stored as body fat, while protein and carbohy drate must first be converted to fat before storage, a more complex, less efficient process that requires energy. For the average person to lose about 0.5 kg of body fat per week, energy intake must be cut by about 500 kcal per day. Reducing caloric intake to between 1000 and 1500 kcal/day, particularly when combined with moderate exercise, produces a gradual but steady loss of body fat and weight. Many popular weight-loss diets are unscientific and can be hazardous. Unbalanced diets that severely limit foods and are deficient in many important micronutrients2 should be avoided. 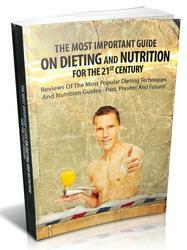 Although "high-protein" diets produce rapid initial weight loss, the loss is transient because water is lost, not fat. High-protein diets can also cause kidney damage and a life-threatening fall in blood potassium. 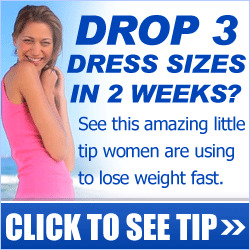 Very low-calorie diets are those providing about 300-400 kcal per day. They should only be used in selected cases and must be carefully supervised by a doctor or dietitian. They often have harmful side effects (e.g., they may trigger gallstones) and are deficient in important micronutrients. Weight-loss diets should contain generous amounts of dietary fiber.3 Fiber adds nondi-gestible bulk, so that eating fiber-rich foods results in satiety with lower caloric intake, encouraging weight loss. Fruits, vegetables, whole grains, and legumes are fiber-rich foods that should be a part of diets for weight loss. Alcoholic drinks (beer, wine, and spirits) contain large amounts of calories; for example, a medium-sized glass of dry wine contains about 120 kcal. Should be low-fat (less than 20 g fat/day) and low-calorie (about 1000 cal/day). One-third of calories should be from high-quality protein (low-fat milk products, eggs, fish) Half of calories should be from carbohydrates (whole grains, fruits, vegetables, peas, and beans). Fig. 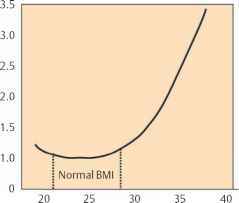 5.6: Relationship between mortality from all causes and body weight as defined by body mass index (BMI). Very low or very high BMIs correlate with increased early mortality risk. Combine diet with 30-45 minutes of aerobic exercise (walking, jogging, swimming) at least three to four times per week. Take a complete, balanced multivitamin/mineral to supply micronutrient needs.